What caused early 20th Century warming? While natural forcings can account for much of the early 20th Century warming, humans played a role as well. Additionally, the early century warming wasn't as large or rapid as the late century warming, to which these natural factors did not contribute in any significant amount. But more importantly, we don't assume that the current warming is caused by humans because it's "unprecedented" or faster and larger than previous natural warming events. We know the current warming is anthropogenic because that's what the physical evidence tells us. Although there was a significant increase in global temperature in the early 20th Century, the rate of warming from 1910 to 1940 was lower than the rate of warming from 1975 to 2005, at about 1.3 vs. 1.8°C per century, respectively. That being said, it's worth taking a look at what caused the early century warming. Several different factors contributed. Although humans were not burning very large amounts of fossil fuels or emitting large amounts of carbon dioxide (CO2) in the early 20th Century, relative to the late century, CO2 emissions were non-negligible and did play a role in the early century warming. The best estimate for the climate sensitivity parameter is 0.8 (Wm-2K-1). Thus at equilibrium, this CO2 change would be expected to cause a 0.22°C increase in the average global surface air temperature. Meehl et al. (2004) plots the estimated anthropogenic contribution to temperature change in Figure 1 below. Most of the anthropogenic influence comes from CO2. Figure 1: Climate model results from anthropogenic forcings compared to observations (black line). The red line is the average of the four-member ensemble. The pink shading is the model range. The blue line is the ensemble mean and the light blue shading is the ensemble range. As you can see, the best estimate of the anthropogenic contribution to the 1910-1940 warming is approximately 0.1 to 0.15°C. This is smaller than the value we calculated above because the planet is not immediately in equilibrium. Much of the energy imbalance goes into the oceans, causing what's known as the "ocean lag" due to the thermal inertia of the oceans. The same lag effect applies to natural forcings. The solar radiative forcing is the change in total solar irradiance (TSI) in Watts per square meter (Wm-2) divided by 4 to account for spherical geometry, and multiplied by 0.7 to account for planetary albedo (Meehl 2002). The albedo factor is due to the fact that the planet reflects approximately 30% of the incoming solar radiation. As with CO2, we calculate the equilibrium temperature change by multiplying the radiative forcing by the climate sensitivity parameter. Wang, Lean, and Sheeley (2005) compared a flux transport model with geomagnetic activity and cosmogenic isotope records and to derive a reconstruction of TSI since 1713 (Figure 2). As you can see, in the early 20th Century, from about 1900 to 1940 there was an increase in TSI from about 1365.5 to 1366 Wm-2, which we can plug into the formula above. However, previous studies have estimated a TSI change as large as 2 Wm-2, so we'll estimate the change at 1 Wm-2. We then only need the solar climate sensitivity parameter. The climate response to different radiative forcings is similar, but not identical. This is known as the "efficacy" of a radiative forcing. According to various studies of the direct solar forcing efficacy (from TSI alone), as summarized by the IPCC (Figure 3), it is likely smaller than the CO2 efficacy. However, since there may be indirect solar effects not accounted for in the direct solar radiative forcing calculation, we'll conservatively estimate the solar climate sensitivity parameter as equal to the CO2 climate sensitivity of 0.8 (W m-2K-1). Thus at equilibrium, the solar change would be expected to cause a 0.15°C increase in the average global surface air temperature. Simlar to the anthropogenic contribution, the best estimate of the solar contribution to the 1910-1940 warming in Meehl (2004) is approximately 0.1 to 0.15°C (Figure 4). Figure 4: Climate model results from the solar forcing compared to observations (black line). CO2 and the Sun played the largest roles in the early century warming, but other factors played a part as well. For example, human aerosol emissions caused a slight cooling, ozone and other greenhouse gases caused a slight warming, low volcanic activity resulted in a slight warming, and natural cycles like the Atlantic Multidecadal Oscillation (AMO) may have contributed to the warming as well (Tett et al 2002). Meehl (2004) plots the net natural contribution to the warming in Figure 5. 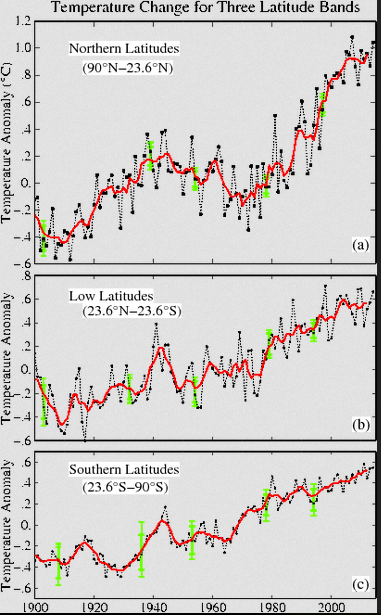 Figure 5: Climate model results from all natural forcings compared to observations (black line). The "skeptic" logic behind this argument is usually that if the early 20th Century warming was as large as the late century warming, and was natural, then the current warming could be natural as well (note that we've discussed the mid-century cooling elsewhere). Ultimately while natural forcings can account for much of the early 20th Century warming, humans played a role as well. Additionally, the early century warming wasn't as large or rapid as the late century warming, to which these natural factors did not contribute in any significant amount. Last updated on 24 March 2011 by dana1981. Tamino at Open Mind examines the role of volcanic forcing (or lack thereof) in early 20th Century warming in Volcanic Lull. One point to consider: oil and gas as fuels did not come into widespread use until the mid 1950's and began to supplant coal from 1960 onwards. Coal was the major fuel before 1940 and emission controls virtually non-existant, so there would also have been a cooling effect from aerosols to (partially) balance GG emissions. The fact of the matter is that there is no actual evidence for the 30 years of warming attributed to CO2 to be anything other than natural. Our contribution, of various sources, not just CO2 is negligable. Most of the arguments presented against CO2 have some merit and the answer is most likely in the combination of all. ..and yet there is a massive amount of evidence that the warming of the last 30 years is not "natural". The warming has followed the truely massive increases in CO2 emissions especially since the 1960's. Atmospheric CO2 concentrations rose rather slowly throughout the early 20th century. They were approaching 300 ppm in 1900 and reached 320 ppm in 1962. Since then we've raced up to 386 ppm. That's the likely source of the large scale global warming of the last 30-odd years. So to suggest that "our contribution, of various sources, not just CO2 is negligible" (whatever that might mean!) just doesn't accord with the real world evidence. I'd like to know what these "arguments presented against CO2" that "have some merit" actually are...can we have a list please? "Also, after a burst of volcanic activity in the late 18th century, there was a relative quiet volcanic period in the early 20th century." Did you mean 19th century for the former period? oh ok, so back then it was a few things causing the warming but now its only co2? 386 ppm is relatively small considering our atmosphere has sustained life with a co2 count of 10000 ppm, albeit a rather long time ago. Response: "so back then it was a few things causing the warming but now its only co2"
No, CO2 is not the only driver of climate but currently it's the strongest climate forcing and also the fastest rising. "our atmosphere has sustained life with a co2 count of 10000 ppm"
In past periods when CO2 was much higher, solar output was also much lower. What really hurts species is when climate changes quickly - the species cannot adapt quickly enough. This is why in past periods when climate has changed quickly, it's been accompanied by mass extinctions. The URL here (both basic and intermediate) is apparently out of date. Response: [Daniel Bailey] Thanks, Chris, for bringing that more recent Tamino post to our attention. Tamino's newer post, which you cite, looks at the overall warming and cooling trends of the 20th Century as a whole and examines supporting evidence to understand them. Anne-Marie Blackburn based this post largely on Tamino's earlier post, Volcanic Lull, which looked specifically at the volcanic contributions to global temps earlier in the 20th Century (I've supplied a working link to it in this response). Future versions of this post will have the correct updated URL in the main text. Thanks for the help! I agree with barry in #4 that "the 1800s" has been confused with "the 18th Century." His post was almost a year ago, and there have been responses in the interim ... why hasn't this single-character edit been effected? Response: [Daniel Bailey] Until lately, lack of manpower. I'll see about getting this one fixed. Thanks for noticing it & bringing it to our attention! I made a few mistakes in my regression of TSI vs SSN. The 0.80 R-squared is from the ACRIM TSI dataset (not PMOD) vs the smoothed SSN (not raw SSN). Plus as stated I used post 1992 data to avoid the "ACRIM gap" issue. For comparison the post 2003 TIM TSI dataset shows an R-squared of .73 when regressed against the smoothed SSN. Standard error on ACRIM TSI vs Smoothed SSN regression is 0.21 W/m2. All of these numbers from monthly average datasets. Moving on I created my own TSI reconstruction from the regression formula (0.0109x+1360.9), and looked for the TSI trend in the period of interest. Regression trends from psuedo-wave functions like SSN are tricky, your period should go from peak to peak or trough to trough, anything else introduces a bias. So I calculated the trend from 1902 to 1954 to straddle my area of interest. The slope is .09W/m2/decade, which would work out to an approximate change of 0.36W/m2 in TSI from 1900 to 1940. Note that above the discussion starts by quoting an approximate increase in this period of about 0.5W/m2 in TSI, so my TSI reconstruction number is lower but in the ballpark. Using the method above, but my delta TSI for 1910 to 1945 (about 0.3W/m2), the temperature increase from the TSI change is about 0.05C, or 1/2 to 1/3 of the number above. Let's say we agree on the Skeptical Science CO2 calculation above (0.15C increase from CO2 alone). Let's also say my calculation on TSI is correct (0.05C). Let's also say the contribution from aerosols is zero (it should be some small negative number since they were increasing, and the net effect of aerosols is cooling, but we'll ignore for this analysis). Add the TSI/CO2 change up and you have a global SAT increase of 0.2C in the period 1910 to 1945. However, the observed change is close to 0.5C in this period. Say the error on CO2 is +/- .04C, and the error on TSI is +/- .05C. The maximum temperature change is about (0.19+.10) 0.3C. Still not close to the actual of 0.5C. Thats assuming the aerosol impact is zero, but it's not. It's cooling, thereby dragging the model number lower than my 0.2 to 0.3C model increase calculation. My argument is that despite the presentation above, you cannot account for the rapid increase in temperature from 1910 to 1945 using only TSI and CO2 and aerosol inputs. There is some other factor at play missed by the models. Obviously the main disagreement between myself and the above Skeptical Science calculation is the TSI input, but after doing my own reconstruction based on a very good correlation between ACRIM and SSN (smoothed), I think the 1W/m2 delta TSI in this period is just too high. The distinct lack of major volcanism between 1915 and 1960 is a major factor in the rapid warming in the early twentieth century. 2) Your trend calculation ignores that 1910 was very close to a solar minimum while 1940 is close to a solar maximum. Simply taking the trend while ignoring the difference in the position in the solar cycle underestimates by about half the change in TSI between the two periods. Klapper, can see if I have the argument right? Observed warming is consistant with published model hindcasts for this period (especially when difficulties with forcing estimation is accounted for). However you are discounting this because the forcing that the models use do not match your own fairly crude estimates of forcings which you prefer to estimates based on published papers? Is this a fair summary? If so then I think you should presenting direct critique of relevent forcing papers, outlining where you think they have overlooked or made errors. (-snip-). Read my other posts on aerosols since I agree with you that aerosol component had low leverage in the 1910 to 1945 period. I checked the trend calculation also from 1915 to 1945 since that avoids the effects of the Katmai eruption at the beginning of the period. It doesn't really change much from trends calculated for SAT in the 1910 to 1945 period; the numbers to 2 significant digits are between 0.15 and 0.14C/decade. As for the point on solar minimums, 1910 is a solar minimum and so is 1945, so I'm including 3 complete solar cycles in my solar analysis, which is another advantage to analyzing this period (along with minimal aerosol input). If you wanted to be nitpicky, the trend 1912 or 1913 to 1945 would be a better one to evaluate since it's more "perfect" in isolating the solar cycles to complete ones, but as I've noted the 1915 to 1945 trend is really no different than the 1910 to 1945 one in the observations. Actually, although my most recent comment sets aerosol cooling to zero, we should be careful about minimizing aerosol leverage in this time period. While it is true there was only one major volcanic episode, the anthropogenic component was more coal, less oil (hence more sulfur dioxide), plus emission controls were nil in that period. Total fossil fuel consumption in the period 1910 to 1945 was about 1/4 to 1/5 the consumption rate from 1970 to 2000, but it was pretty dirty. I'm only saying this to note I know the anthropogenic aerosols from this period can't be directly compared to the emission rate per fossil fuel input as later in the 20th century. 2. We have poor direct information on aerosols, but the fossil fuel consumption rate is low, and there is only one major volcanic episode, so we can assume aerosol cooling is not significant. 4. The period includes complete solar cycles (and I would argue we have reasonable reconstructions of TSI but that may be a point of argument for some). In short, what's not to like about 1910 to 1945? Response: [DB] Moderation kvetching snipped. "As you can see, in the early 20th Century, from about 1900 to 1940 there was an increase in TSI from about 1365.5 to 1366 Wm-2"
My estimate for delta TSI from 1900 to 1940 is 0.36W/m2. Just round it off to 0.4W/m2. This posts starts out by saying the increase is 0.5W/m2, but because there have been higher estimates, ups that to 1W/m2 delta TSI, without justification in my mind. If the above 5 points are true then we just have one major point to agree on: delta TSI. Of course these are back of the envelope calculations but that's the starting point of this post in the first place. My real point is that I think you have a problem with your models in this period, which is a good one to evaluate as I've discussed above and it's not enough to just say it's within the margin of error and call it a day. 1) Regarding anthropogenic aerosols, the period 1910-1940 saw the phase out of coal and replacement by oil as a fuel for ships, and a partial replacement of coal with oil for stationary power generation. That means there were less aerosols produced per unit CO2 in that period than during the preceding thirty years. 2) More importantly, the virtual elimination of stratospheric aersols over that interval represents a strong positive forcing. I believe it, rather than the enhanced solar forcing, is considered to be the primary reason for the rapid increase in temperature during that interval, just as the reintroduction of stratospheric aerosols is a significant factor in the slight cooling from the mid 1940s to the late 1960s. I do not think we are agreeing. I think you have missed my point. 3) Even allowing that you are interested in the period from 1910-1945, peak solar output increased far more over that period than did minimum solar output. By benchmarking your trend on the minimums, I still believe you to be underestimating the increase in solar forcing. Your point 2: Show me the math on aerosols warming 1910 to 1945. Aerosols can't warm, they can only cool (not quite true since black carbon can be a positive forcing). Your point 3: I'm not "benchmarking" (whatever that is in this context) on the solar minimums. I'm saying you can only calculate trends in pseudo-waveform functions like TSI by calculating trends from peak to peak or trough to trough, either method works, hence my adoption of the 1910 to 1945 as a good period to evaluate. My calculated delta TSI of 0.09W/m2/decade is based on a minimum to minimum trend period only since the minimums are less noisy than the maximums. I checked both 1902 to 1954 and 1912 to 1944, but got the same number (0.09W/m2/decade) for delta TSI. We do not agree on net aerosol effect. Again, you are claiming that your construction of the net forcings over this period is better than the published ones, but you do not seem to be making reference to any of the published papers to challenge their methodology and, as TC and Bob have pointed out, ignored important factors in aerosols. (Change in BC, volcanic quienessence). Klapper, others - Note that there is some ambiguity about the sunspot numbers - according to Svalgaard 2012, due to changes in counting methods the sunspot numbers pre-1875 are low by a factor of 50%, and the numbers from 1940 onward are high by a factor of 20%. I don't know if these adjustments are generally accepted, but if they are correct your TSI estimates will be off accordingly. First, a quick clarification for anyone that reads this portion of the thread at some point in the distant future. Klapper's comment #8 is the result of a thread happening here that was getting off topic, and is moving into this thread where it is more on topic. From what I understand, you have regressed TSI in the recent period against sunspot numbers, and then used that to estimate TSI in the period 1910-1945, and then used that TSI trend to compare to the temperature trend. In essence, what this is doing is just attempting to explain the temperature trend by correlating it with sunspot numbers. This is not a very sophiitcated model, and the idea that your model is better than the models in the literature is - shall we say - somewhat dubious. All I can suggest is that you take scaddenp's comment to heart, and think about how crude your model is (and it is a model). But to expland on certain points, let's first think about your use of sunspots. Sunspots are dark areas on the surface of the sun, and thus are spots that emit less radiation, not more. This has been directly observed using space-borne measurements of TSI during times of transit of sunspots across the visible solar disk. Yet increased sunspot numbers are associated with increased TSI on average, so the increase can't be just because of the sunspots. In fact, sunspots are just an indicator of something else that is going on with the sun, just as tree rings are an indicator that something is going on with the local climate. Sunspots are a proxy for solar activity, not a measurement of TSI. Sunspots are a not the best that science has to offer. Thus, you are basing your conclusions on a poor proxy for TSI, and this is leading you astray. Better estimates of past TSI use more sophisticated models, and are more likely to provide more useful results. Your understanding of aerosols and their effects is also very simplistic. In #14, you say "aerosols can't cool", and this is wrong. 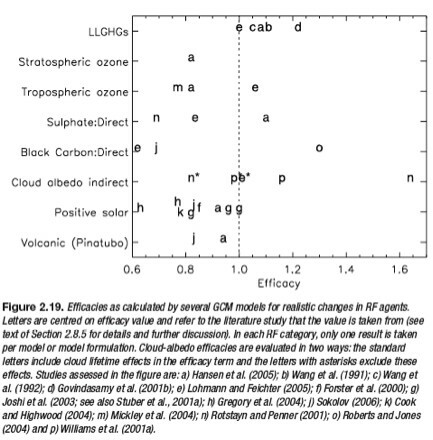 The effect of aerosols differs greatly depending on whether they are mostly-absorbing (e.g., soot), or mostly-scattering (e.g., light-coloured dust). This is usually quantified in terms of the "single scattering albedo". Although generally aerosols cause surface cooling, this is not always the case. A highly-scattering aerosol over a highly-reflective surface can have a warming effect, because is also affects the solar radiation reflected off the surface. A highly-absorbing aerosol reduces the solar radiation reaching the ground, but causes warming at the altitude the aerosol is located at. To thoroughly account for aerosols, you have to have knowledge of their optical properties and size distributions, as well as their geographical location and altitude. The trends in these properties over time will affect the temperature trends. Thus, you are basing your conclusions on a poor understanding of aerosols, and this is leading you astray. Looking solely at direct relationships between forcing factors (TSI, aerosols, etc.) and temperature ignores any time lags in the climate system. We know that forcings don't instantaneously result in temperature changes - it takes time for the climate to equilibrate. Thus, your anaylsis uses a simplistic relationship between forcings and temperature, and this is leading you astray. You have assumed that your simplistic reconstruction of TSI is better than the experts. You have assumed that aerosol effects over the period are zero. You have assumed that a simplistic model of T = f(CO2, sunspots) is valid. You then conclude that the experts have something wrong, even though the experts' models are much more sophisticated. Thus, you have assumed your conclusion. This is leading you astray. "My real point is that I think you have a problem with your models in this period, which is a good one to evaluate as I've discussed above and it's not enough to just say it's within the margin of error and call it a day." I think this is following on the discussion on the other thread, where it was stated that lack of accuracy in model inputs places limits on how well we can expect models to match past temperature records. This has led to the current discussion of reconstructing past TSI and aerosol forcings. Klapper seems to feel that the models need some fixing to better match past climates, and seems unwilling to accept that there may be not much that can be done about it, due to inaccuracies. I will try to illustrate why limited accuracy of forcings limits our ability to "fix" a model, by using a very simple (non-climate) model. Let's assume that we have a model that says A + B = T. We have measurements of T that tell us it was 15.2 +/- 0.1 at some past time. Unfortunately, we do not have good estimates of A or B at that time - we only have proxies, and our best guesses are that the past values were A = 10.4 +/- 0.6, and B = 5.6 +/- 1.0. Thus, our model says that T = 16.0 +/- 1.2 (assuming independent errors for A and B). Is the model right or wrong? Well, the direct measurement of T is 15.2 +/- 0.1, and our model says it should be 16.0 +/- 1.2. The observation falls within the errors for the model, so the observation does not disprove the model. The model could be right. More importantly, are we justified in modifying the model? We could "improve" the model, by making it 0.923*A + B = T, and our model would then predict T = 15.4, which matches the observation. Is this justified? We could just as easily make the model A + 0.857*B = T, and get an exact match. Or, we could play with any combination of fudge factors for both A and B to get a matchj - there are an infinite number of them that would work. The problem is that there is no way of determining if any of these arbitrary "fixes" is correct, because we have no further observations of any kind that can differentiate amongst the possibilities. Indeed, within the error bounds of our data, the fudges that give an exact match between predicted and observed T are no better than our original model A + B = T. They all fall within the error bounds. Those error bounds already tell us that the original model may be correct. When a model's output (value plus error bounds) already falls within the error bounds of the observations, it is a Bad Idea to try to tune a model through purely arbitrary adjustment of parameters. Such adjustments, even if they improve the match between model output and observations, do not mean that we have improved the model. It is a Good Idea to try to improve upon the knowledge of the various input variables/parameters, but you do not accomplish this by just trying different numbers in the model - you need an independent source of information. Blindly fudging parameters is just fitting to the noise. The Blogosphere is full of fake skeptics that think they have a good model just because they can get an arbitrary series of equations (usually "cycles") with arbitrary fitting of parameters, all while ignoring the known physics. It will be gussied up in terms of statistics or Fourier Analysis, or some fancy words, but it is not good science. A great place to see these things taken down is Tamino's, where is is often called Mathturbation. In Klapper's case, it appears that he is looking at the experts' models, for which observations do fall within model output (value plus uncertainties), and replacing them with worse models, which show a poorer match with the observations, and convincing himself that the experts are wrong. Are you saying that the soot effect (warming) outweighs the sulphate effect (cooling) in the period 1910 to 1945? From the IPCC AR4 report, FAQ2.1, Figure 2, the net effect of anthropogenic aerosols is clearly negative (cooling), totalling about -1.2 W/m2 since the dawn of the industrial era in 1750 to 2005. I downloaded some TSI reconstructions covering the period 1910 to 1945 to cross-check my smoothed SSN/ACRIM model. I started with a relatively new one at the SORCE website described as "computed by G. Kopp using TIM V.12 data on Jan 19, 2012". This reconstruction has annual resolution. 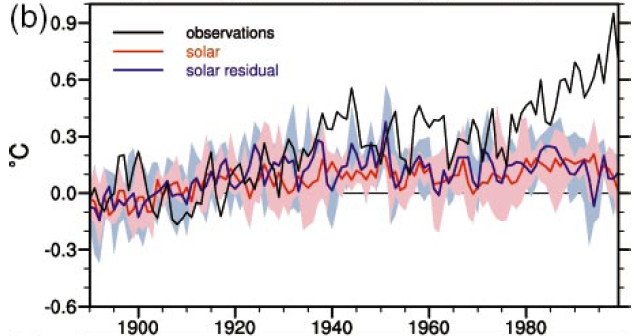 Between 1912.5 and 1944.5 (solar cycles 15,16 and 17) the trend in TSI is the same as one I've suggested based on my model (Kopp trend = 0.083W/m2/decade). I also downloaded a daily TSI reconstruction from the Max Planck Institute, authored I think by N Krivova. In the period of 1912 to 1944.5, the trend of this reconstruction is lower than mine (Krivova trend = 0.042W/m2/decade). I then discovered a link to a spreadsheet compiled by Leif Svalgaard circa 2009? containing a number of reconstructions, albeit all annual and not well documented as to source. However, from the labels I assume these are Hoyt & Schatten 1997, Lean 2000, Wang et al 2005, Dora & Walton 2005, and one by Leif himself. In summary, there are 3 reconstructions the same as mine (Kopp, Wang, Dora), 2 substantially lower (Leif, Krivova) and 2 substantially higher (Lean, Hoyt). Note the 2 oldest reconstructions are also the highest, so I'm sticking to my estimate of a net TSI change between 1910 and 1945 of about 0.3W/m2, which calculates to an equilibrium temperature rise of about 0.05C. See my post #20 on the subject of TSI. My model may be crude but it gave the same result for the period 1912 to 1944 as Wang et al 2005, Dora & Walton 2005, and Kopp 2012. On the subject of aerosols, see my post #19. The IPCC AR4 report says anthropogenic aerosols are a net negative forcing (just like volcanic aerosols). I've said let's ignore aerosols in the 1910 to 1945 period, but if you don't want to, then let's assign the aerosol some negative forcing number for our model cross-check calculation. My argument is pretty simple, when you put in reasonable values for GHG, TSI forcing (aerosols too if you want), your model forecasts a warming in the 1910 to 1945 period so low that the high end of the forecast is below the low end of the observation error, i.e. the model fails. Klapper - Just to be clear: are you or are you not using all of the observed forcings in your model runs? You've stated: "I've said let's ignore aerosols in the 1910 to 1945 period..."
If you are not applying all the forcings to your model runs (by ignoring or assigning arbitrary forcings to aerosols, for example), it is entirely unsurprising that you aren't seeing a good match to observed temperatures. You still fail to see the error of your ways. It's not that your reconstruction of forcings is not possible, it's that it is not possible to exclude the others that are different (based on current knowledge). So you can come up with something that falls within the range of values in the literature? That's like saying "gravity still works!". The answer is "so what? - we've already included that in our estimates of our uncertainty." You error is assuming that your reconstruction is the correct one, and therefore the models are wrong. The fact that numerous attempts to reconstruct TSI (or aerosol forcings) lead to different results forces us (pun intended) to conclude that the uncertainty in those forcings is too large to come to reliable conclusions beyond what has been stated in the literature. By choosing to rely on one estimate of forcings - even if it is within the range of values in the literature - to the exclusion of others that do not conform to your conclusion is called cherry picking and confirmation bias. The proper way to handle the uncertainty is to accept it. Unless you can provide an independent evaluation of your TSI reconstruction, you are chasing your tail in the noise of uncertainty. Different estimates of past forcing in the literature may later be identified as problematic through more study of the physics of solar output, and future reconstructions may improve on that basis, but what you are doing is choosing which reconstruction to believe because it agrees with your desired conclusions. I'm not doing model "runs". If you read my posts, I'm accepting the CO2 calculation for temperature change in the period above as done by Dana81. I'm not accepting the calculation for TSI; I think it's too high, but I'm using Dana's TSI formula for the temperature change in this period, but my own delta TSI. Actually, I made a huge mistake by calculating my own TSI reconstruction from SSN's/ACRIM. I should have said "For TSI I'll use the 3 most recent reconstructions I could find" (i.e Wang et al 2005, Dora & Walton 2005 and Kopp 2012). It's pretty much the exactly same number, but no one would have wasted time arguing with me about my TSI estimate. If I can find a source for the aerosol forcing, I will add a calcuation for aerosols, since adding aerosols to the equation helps my argument by adding a negative number to the model temperature change. In the end I'm just cross-checking the calculation done by Dana above, but with a different TSI number. My analysis of the various reconstructions indicates his number of 1 full Watt/m2 increase in TSI in the period of interest is too high, even his first statement on 0.5W/m2 increase in the period looks high. Skip my TSI reconstruction. I'll use the average of Wang et al 2005, Dora & Walton 2005, Krivova & Solanki 2008 and Kopp 2012 instead to calculate delta TSI. They are the most recent I could find so I'll assume they are the best. Also, if I can find an aerosol forcing model, I'll add the aerosol component for 1910 to 1945 to the calculation. Klapper - I would suggest as a starting point following the link I previously provided for tables of forcings, and from there to the tropospheric and stratospheric aerosol measures. Those include listing multiple supporting references that you can read for questions you might have regarding those measures and uncertainties. Again - if you are leaving out major forcings such as aerosols, you are basically guaranteed to have incorrect results. Klapper @25: "They are the most recent I could find so I'll assume they are the best." Why would you assume that? If they do not reflect the range of reasonable values that are supportable in the literature (remember, we have no direct satellite-based measurements of TSI from the 1910-1940 period to check the reconstructions against), then you are assuming that TSI for the period is known with greater accuracy than it is. "The best" in science isn't necessarily decided by "the most recent". You just may be on your way to assuming your conclusions again. Klapper: if you haven't already seen it, I suggest you read the comment here, posted on another thread. Look for the quote half way down, from Gavin Schmidt (RealClimate) on the 1910-1940 period. I checked the graph (a) from Hansen et al 2007 at the GISS website link you provided. In the period 1910 to 1945 the reflective aerosol and indirect aerosol effects combined look to almost cancel out the forcing from GHG's. There are postive forcings from BC and TSI in this period but these forcings estimates appear to be small compared to GHG's and aerosols. To me this confirms what I've been saying all along: there is some forcing at play in the 1910 to 1945 period which the models have not captured. Since these forcings come from the GISS E model, I also checked the warming rate from a GISS Model E2-R model run of the 20th century from the CMIP5 database. The warming rate in the 1910 to 1945 period from that model is 0.043C/decade. Compare that to the actual observations of 0.14C/decade. By including aerosols, the model/observations divergence just becomes that much worse. The error on the GISS model trend would have to be +/- .06C/decade to close the gap with the observations. If Gavin thinks there's reason to believe the lapse rate, or ocean heat mixing were different in the period 1910 to 1945, then he should do a model run to see if that explains the model/observation discrepancy. As it is, I checked a GISS Model E2-R model run of the 20th century and it predicts a warming rate of less than 1/3 the warming rate of the observations in this period. There is no excuse the trend isn't long enough either. There is also no excuse that volcanoes muddled the picture. If the error boundaries overlap, absolving everyone from having to think about this discrepancy, they probably only barely overlap. I don't think I'm going to convince you this period is worthy of more detailed investigation, and may pose a problem for model assumptions, and I don't think I'll try. I've done enough back of the envelope calculations on TSI (and also aerosols, using some guesstimates for forcing from Hansen et al 2007, chart (a)), to believe the model/observations gap is larger than the posting above would have you conclude. Please no comments on "back of the envelope" after all that's all the above calculations are too. "Gavin ... should do a model run to see if that explains the model/observation discrepancy." All the model runs in the world will not improve the accuracy of the observations. Gavin's quote clearly talks about the lack of suitable observations in the period in question. You cannot "improve" a model to the point where it is more accurate than the observations you are testing it with. Trying to fit the model to errors in the data will just introduce errors into the model. It is becoming increasingly obvious that you cannot see past this barrier to your learning. "absolving everyone from having to think about this discrepancy.."
Now you're just creating strawmen. I never said the period wasn't worthy of investigation. There is a limit to what can be done, however, due to the limitations of the observations that are available to test the model. Unless the observations (or proxy reconstructions) can be improved, doing more model runs won't change that. It is far more productive to continue to work on comparing the models to more recent periods where observations are more complete. Given the lack of any response to my question regarding my example at #18, I will conclude that you either haven't bothered reading it, don't understand it, or are just unwilling to deal with its implications. Until you provide an answer to my question (in #27), instead of avoiding it, there seems little point in watching you chase your tail. Bob, your posts are too long. Don't waste your time bloviating about sociology/politics, just stick to what's wrong with my numbers. I have read your #18 post but I'm not going to respond to non-qualitative commentary (more or less, I might change my mind but for now let's just stick to numbers/quantitative type commentary).For example, if my delta TSI number of 0.09W/m2/decade is wrong, then show me a recent peer-reviewed number that is higher, and give me the reason it is better. I have already told you why a reconstruction using nothing but sunspot numbers is poor/limited, and KR has pointed you to literature disucssing sunspot number in more detail. That you dismiss a mathematical discussion - of how limited accuracy in observations means limited ability to improve models - as "bloviating about sociology/politics" tells me pretty much all I need to know about your scientific skills. It is up to you to demonstrate why your back of the envelope calculation is better than what is in the literature. I won't hold my breath waiting. Whenever I show this plot in a talk, someone invariably asks about the cause of the maximum around 1945. The only info I can find, including your posting above, talks about the general increase from about 1910 to 1945, followed by aerosol cooling until around 1975. 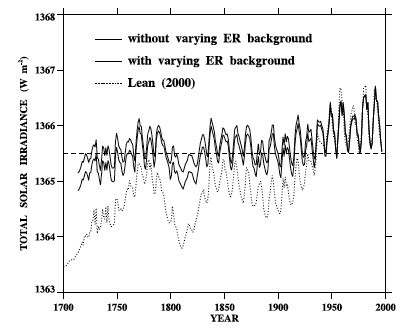 This 1935-1950 feature certainly looks real so the only thing I can say to the questioner is that I am not aware of a specific answer from climatologists, but I suppose that the pronounced bump is an accident of natural variability. The questioner usually appears as unsatisfied as I feel. Do any of you have a better answer? [DB] Resized image breaking page formatting. These graphs, also from GISS, show different regions - Norther exa-tropics, tropics and southern exa-tropics. Quite different pictures. Also this paper might be interesting, particularly figure 11.
tcflood: The narrow WWII peak itself is almost certainly spurious. It only shows up in the SST data, and particularly in ERSSTv4. There are very substantial known changes in SST measurement practices during WWII, which are hard to correct for completely. Hansen discusses it here. The right hand series of panels is ERSST v4-v3b. In it land temperatures are cancelled out and consequently not shown. The middle column of panels (ERSSTv4) however, does show land temperatures. In particular, it shows a very warm Chile plus Argentina, more or less adjacent to the unusually warm south east Pacific temperatures. Further, checking the 250 km resolution, meteorological station only map for the 44-45 period at Gistemp shows an off shore (island) meteological station of the coast of Namibia or Angola which again shows unusual warmth. Finally, the west coast of Australia is warm, although not exceptionally so in the 250 km resolution GISTemp map. These correlations to the warm pools in the SH in that period suggest those warm pools are not, or at least not entirely artifacts. Thanks for the references and comments. Now I can give a more informed answer to the question.